Perched on the Northern slopes of Glencairn, this compact family home enjoys extraordinary mountain views. 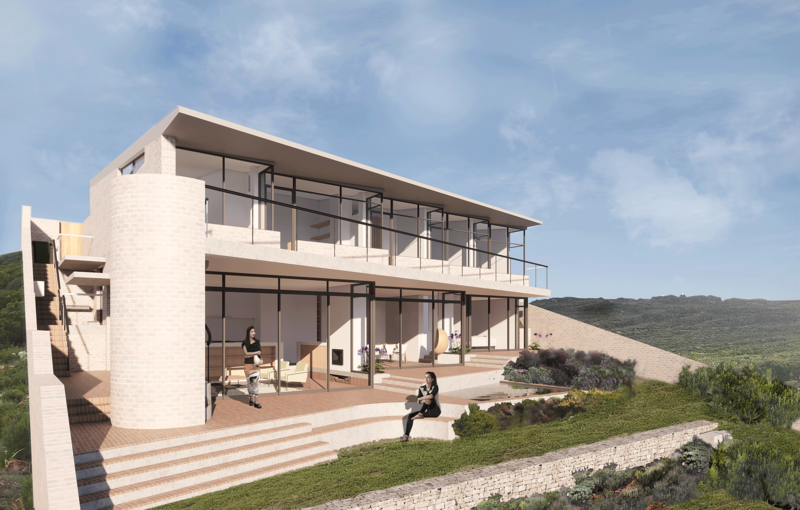 The building works with the contours of the steeply sloping site and nestles itself into the hillside. By sloping the roof in the same direction as the surrounding landscape the building stays connected to its site and reads as a modest single story from the street level. The geometry of the plan has been inspired by the well known projects done by Adel and Antonio de Souza Santos in and around Cape Town during the 1970’s. Each North East facing window creates an open corner towards the view, blending interior and exterior into one. Optimal orientation, insulation, a masonry chimney and carefully designed overhangs ensures that the house has a comfortable temperature throughout the year, eliminating the need for additional heating and cooling.